I hadn’t planned to watch the Olympic Opening Ceremony. I’m not a fan of organised sport, so obviously the Olympics is not my cup of tea – I generally refer to it as the Great Egg and Spoon Race. But I was working late at home on Friday night, and had come to an end just as I knew it was starting, so I thought I would stick on the tv and give it a chance. And most unexpectedly, I was impressed. For a start, there was no sport, which was great. It was also uniquely British – no other country would choose to celebrate the things that Danny Boyle chose, and I like that. It was a good show. And most unexpectedly, there was humour. These sorts of things are usually super-serious, nothing but pomp and ceremony, and viewers usually find the humour in it by pricking that pomposity. But the inclusion of the excellent Mr Bean sketch, and the Queen’s parachuting were completely unexpected, and did a brilliant job of lightening the mood and making it less pompous. A great move, and very daring! And full marks to the Queen for joining in. But the things that impressed me most were actually towards the end. The choice of people who carried in the Olympic flag was remarkable – when I heard the name Doreen Lawrence, I was really surprised. But I loved that the opportunity was taken to acknowledge people who are actually making the world a better place, as opposed to the Olympics, which is meant to be about that, but isn’t really. We could argue all day about who was or wasn’t worthy of it (probably about Shami Chakrabati), but it was a great idea, and I loved it. And then the inclusion of Mohammed Ali, a man once so great, but now unable to stand on his own, speak, or even smile for the event. The Olympics is all about stronger, faster and higher, but those things are fleeting, and I found Ali’s inclusion a poignant reminder of mortality. And then I loved the fact that Danny outfoxed all of the bookies by using a group of young athletes to light the flame, rather than any of the famous names from the past. It was nice to beat the media, and do something that no-one expected. And the cauldron was a very nice piece of art itself. I will of course admit that I didn’t watch all of it – the parade of the nations was more interesting than I had expected, but I still did some wandering in and out at that stage. But I did watch most of it. So good work Danny, an unexpected pleasure! I’ve been riding my bike to work for quite a while now. Ever since I started working for BT lots of years ago, I’ve walked to work. But last year I worked out that cycling wasn’t that scary, it got me into work a whole lot quicker, it’s kind of fun, and it’s a bit healthy. So I have been riding my mountain bike into work. That bike is 6 or 7 years old, it’s got over five and a half thousand miles on it, and it’s showing its age a bit. So I decided it was time to upgrade and get a new bike. Since my last bike cost me about 150 quid , I thought it wouldn’t be too difficult to improve on it. But it’s been a tricky business. The one thing that I knew I wanted were disk brakes, since much of my cycling is done in the rain, and disk brakes should have a bit more stopping power since they are in the middle of the wheel and out of the puddles. So off I went looking at bikes. I quickly got a feel for how the components improve as you spend more money. And I quickly discovered that the disk brakes add a lot to the cost. After a fair bit of looking around all the local bike shops, I very nearly bought a bike a couple of weeks ago, but it was a bit more expensive than I had expected, and to be honest I didn’t like the colour (dark red). When I went back 2 days later, the last one had been sold earlier that morning. So I have been back round the bike shops a few times, and spent a lot of time looking at them on the internet. I very nearly bought one online at the start of the week, but I didn’t really want to buy one over the internet – I wanted to sit on it, and have a bit of a ride on it, and be able to take it back to the shop if bits fell off! And finally today I found one I like, and put down a deposit on it. The picture isn’t of my actual bike, as I have to wait for a fresh delivery, but it’s the one I had a ride on to try it out. 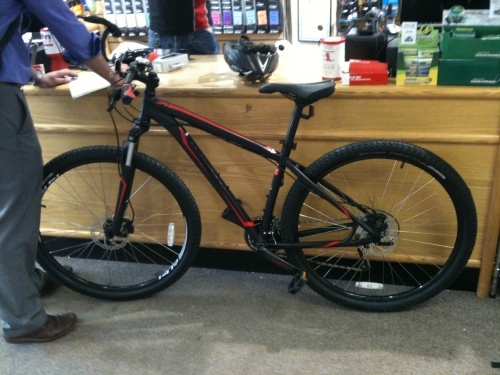 So it’s a Specialized Hard Rock Sport (2013 edition no less), from McConvey Cycles just down the road. Two pieces of musical news today, one from the radio, and one from my ipod. On shuffle while I was out cycling today I heard “Over There” by Glenn Miller and his orchestra. You can imagine my surprise when I immediately recognised it as that curse of the airwaves, the Go Compare tune (and no, I am not putting a link to the go compare tune in my blog! Just turn on your tv, and leave it for a few minutes and you’ll find it yourself). So for anyone who has found themselves whistling or humming that tune accidentally, this is excellent news – it has a more civilised pedigree that you might expect, and your actually humming a Glenn Miller tune! The other musical news is that the Beach Boys classic “Sloop John B” has become a marching tune on the twelfth! They played a clip of it on Talkback, and then Wendy Austin helpfully explained that this was not simply a marching band expanding their repertoire in an unusual direction, but was in fact deeply offensive. I was hugely disappointed, as I would have liked to hear them tackle Good Vibrations or Barbara Ann (though of course flute bands always suffer from not having enough bass which wouldn’t help in the harmonies). I was hoping the story behind this would be that the Beach Boys had accidentally picked a folk tune which also had loyalist lyrics, but it turns out not to be the case. Apparently the Beach Boys did get there first, and then someone did a re-write on their lyrics. If you don’t believe me, you can hear it here. In other non-musical news, the weather has been unexpectedly good, and I got to cycle yesterday and today. Today I made it to the International Airport and back, which was a stupid idea, and I was knackered long before home. But on the bright side I did get to stop for Maud’s ice cream in Templepatrick, which was just what I needed. And another stop at the Indian takeaway down the street to refuel when I got home. 40 miles – a good afternoon out! You are currently browsing the Destroy All Onions! blog archives for July, 2012.